Putin.BLOG Foreign Policy Uruguay Vladimir Putin. Russian-Uruguayan talks. Vladimir Putin met at the Kremlin with President of Uruguay Tabare Vazquez. On the agenda were various bilateral cooperation matters and prospects for expanding trade, economic, cultural and humanitarian ties and developing foreign policy cooperation in various international organizations, primarily the UN, and in regional integration organizations. Following the talks, the two presidents signed a Joint Declaration and witnessed the signing of a package of cooperation agreements, particularly dealing with customs regulation and defense. 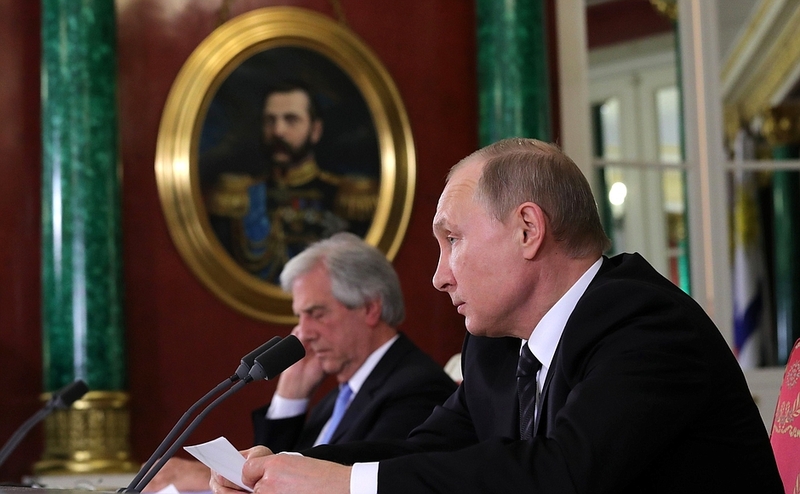 Mr. Putin and Mr. Vazquez also made statements for the press. Beginning of talks with President of Uruguay Tabare Vazquez. Let me welcome you to Russia’s capital. 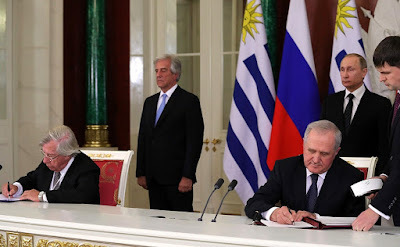 The previous visit by the President of Uruguay to Russia took place a very long time ago, in 1988, but our two countries maintain strong and good relations in practically all areas. This year, we are marking the 160th anniversary of the establishment of diplomatic relations. We are pleased that you have decided to include Moscow in your current European tour. We certainly need to discuss the development of our trade and economic ties. We know that our bilateral trade is not high. Agricultural produce and foodstuffs account for slightly more than 90 percent of our trade, but there are certainly opportunities for expanding our cooperation. 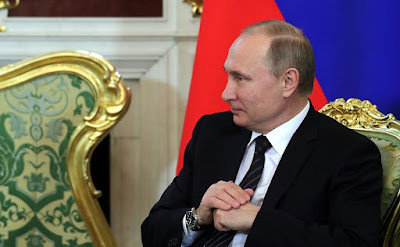 It is a pleasure to note that your country is probably the only country in the southern hemisphere that can boast a town, San Javier, where more than 90 percent of the population is of Russian origin. I would like to thank you for supporting these people and supporting their traditions, including their desire to keep alive their native language and Russia’s cultural heritage. We know, of course, of the active work underway on the international stage. Uruguay is a non-permanent member of the UN Security Council and we are in constant contact on matters on the current agenda. 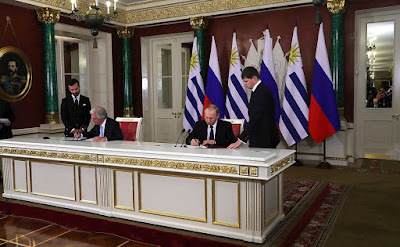 Mr. President, on my own behalf and on behalf of my Government and the people of Uruguay, I want to thank you and your Government for receiving us with such warmth and understanding. This is very important for us. You very rightly noted that this year we are celebrating the 160th anniversary of the establishment of diplomatic relations between our countries. 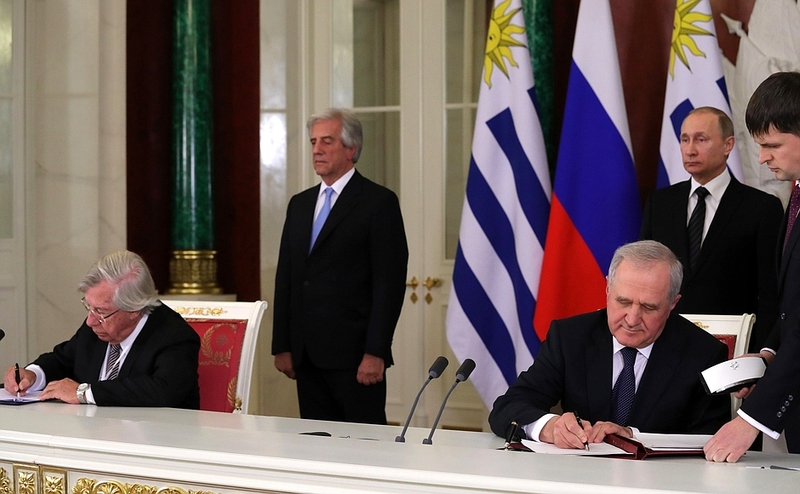 As the Russian Federation Ambassador to Uruguay Alexei Labetsky rightly noted in 2014, our relations have withstood the test of time. 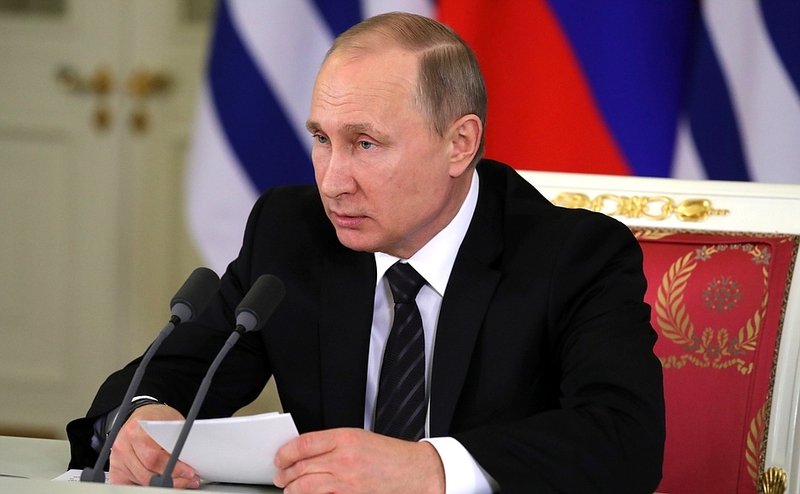 Of course, much has happened in Russia and in Uruguay over this time. However, despite all the events in the world, our countries maintain solid trade ties and cooperation, and most importantly, solid friendship. This is possible because we share the same values and principles. We support freedom, democracy, social justice and solidarity. Here, we can also note our common obligation to fight terrorism, regardless of its origins. We want our peoples and all of humanity to live in peace, and we hope that through dialogue and mutual understanding, we will achieve mutual respect and take our cooperation to a new level. 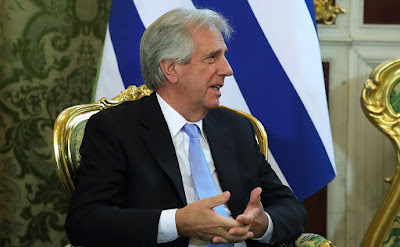 Mr. President, it would be a great honor for the Government and people of Uruguay if you were to visit our country. This would give us a chance to go together to San Javier, where 300 families from Russia settled at the start of the 20th century. We could go and see them together. It is important that these families brought to Uruguay their culture, traditions and way of life, and in this way enriched Uruguay’s culture. They have taught us much. For example, they were the first to start cultivating sunflowers in Uruguay. We are happy to be here on this visit and I am sure that we will work intensively to bolster our relations. 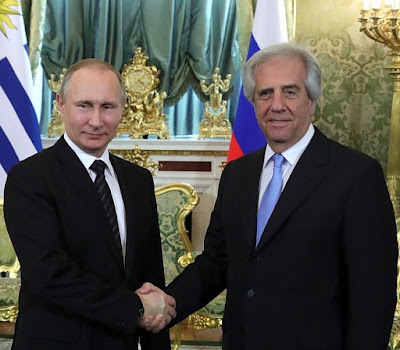 Russian President Vladimir Putin with President of Uruguay Tabare Vazquez. President of Uruguay Tabare Vazquez. 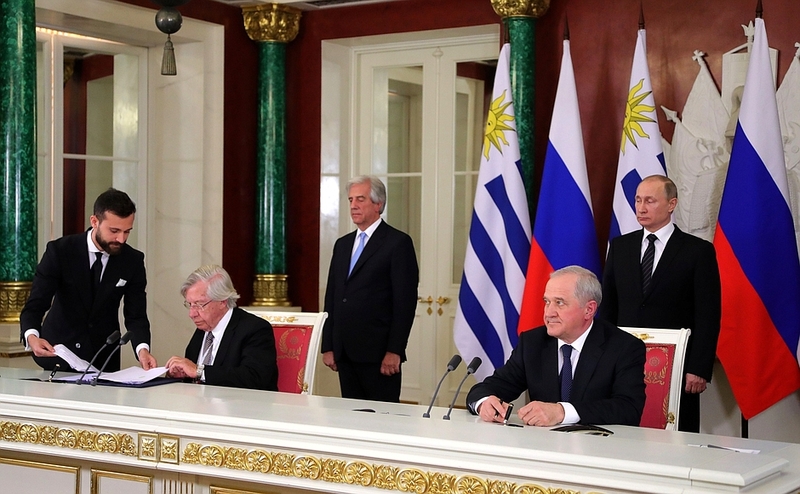 Press statements following Russian-Uruguayan talks. 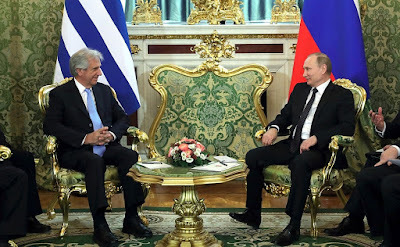 Vladimir Putin with President of Uruguay Tabare Vazquez. 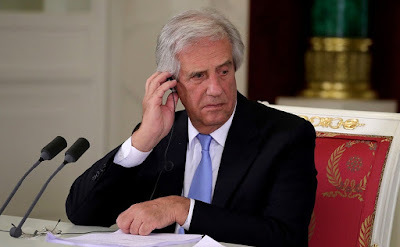 Tabare Vazquez, President of Uruguay. Russian President during Russian-Uruguyan talks. 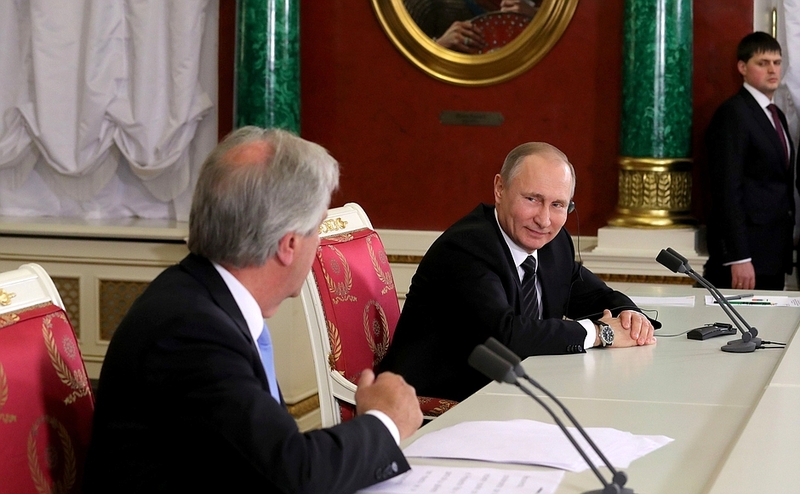 Vladimir Putin and President of Uruguay in Kremlin. 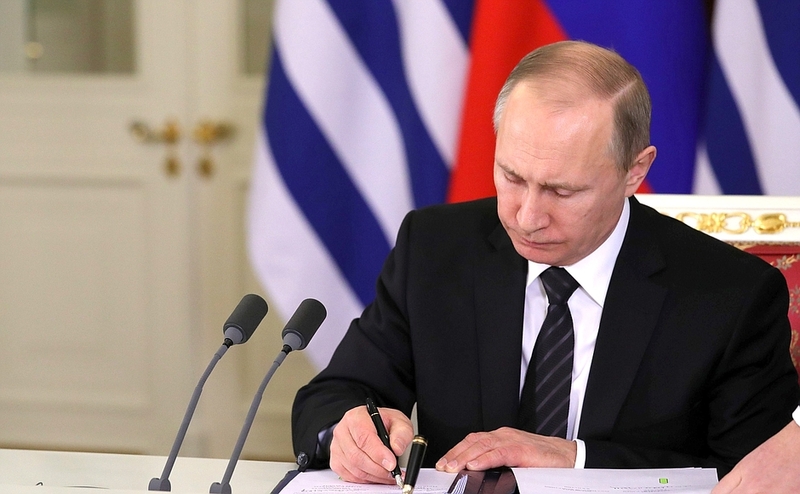 Vladimir Putin signing documents in Kremlin. Vladimir Putin during press conference. Vladimir Putin and Tabare Vazquez signing documents. 0 Comment to "Vladimir Putin. 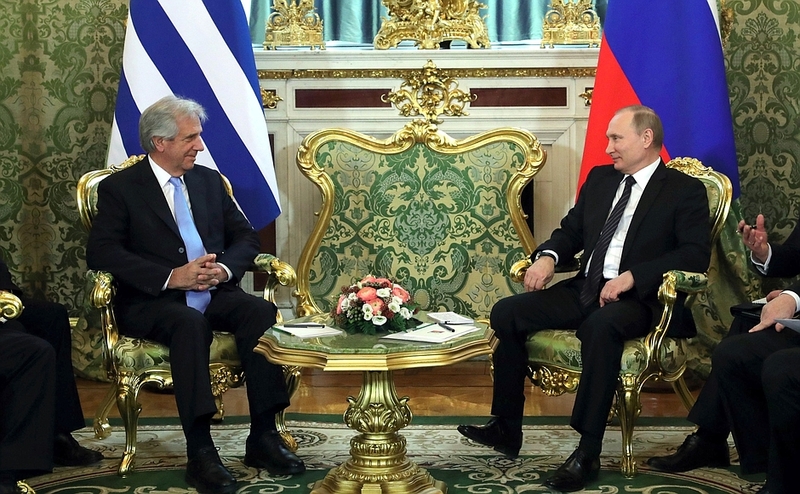 Russian-Uruguayan talks."